The Energy Track enables your students to investigate energy conversions - potential, kinetic and rotational. In addition, using our Timing Plate, projectiles can be studied. The Energy Track apparatus consists of two silver boards attached to a stand. Between the two plastic tracks is a scale displaying the vertical height above the track on the base.The maximum vertical height above the base is 34cm. Many investigations are possible and these are listed in the documentation supplied with the unit - a copy is also available in the Teachers section of the site. To calculate the speed of the ball bearing at the bottom of the ramp a timer with a resolution of 0.1 ms or better should be used. Our Time Speed & Acceleration (TSA) or ALBA Interface and Logger are ideal for this task. 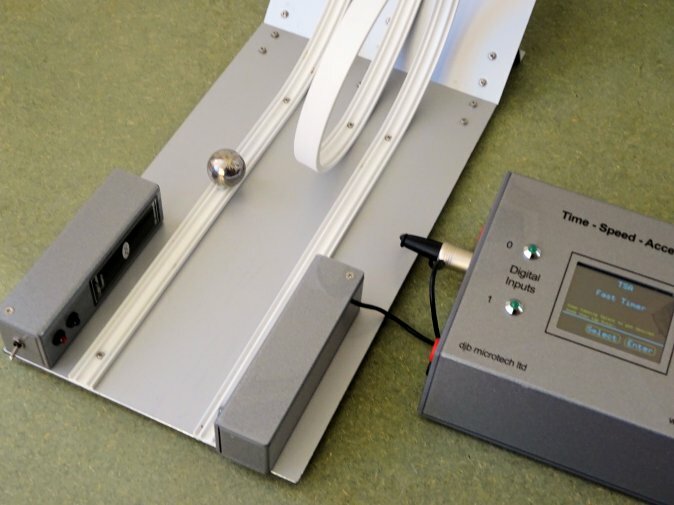 It is also possible to measure the speed of the ball bearing at the bottom and top of the loop. To study projectiles a TSA and Timing Plate are required. The track should be placed right at the end of a bench with the infra red beam as close to the edge of the bench as possible. The Timing Plate is positioned so that the ball lands on it. Setting the Fast Timer to three events allows the launch speed and time of flight to be found. Lots of good interesting Physics can now be done. The Energy Track is supplied with a 1 inch diameter ball bearing. If the djb microtech's Light Gate Source and Light Gate Reciever are used on their side along with TSA then it becomes very easy to measure Times and Speeds. This is because the centre of the 1 inch ball bearing aligns with the light beam - no height adjustments required. Typical results using the ALBA software are shown below - ball bearing running down the straight track.